Enjoy this 6.5-hour guided antebellum adventure with a professional tour guide as you journey through swamps and wetlands to a magical place where time has stood still, the Old River Road. Learn of the land of the Creoles, plantations, slaves, slave revolts, and Quadroom Balls. Tour bus holds up to 25 passengers for this shared, group tour. Your tour begins with hotel pick up at your French Quarter or downtown New Orleans hotel. You'll drive past plantations Evergreen, Columbia, Whitney, Laura, Felicity and Saint Joseph, and stop to experience the showplace of the Old South, the majestic Oak Alley Plantation. Tour the antebellum mansion for approximately 1 hour and 40 minutes, and take pictures of the beautiful grounds. 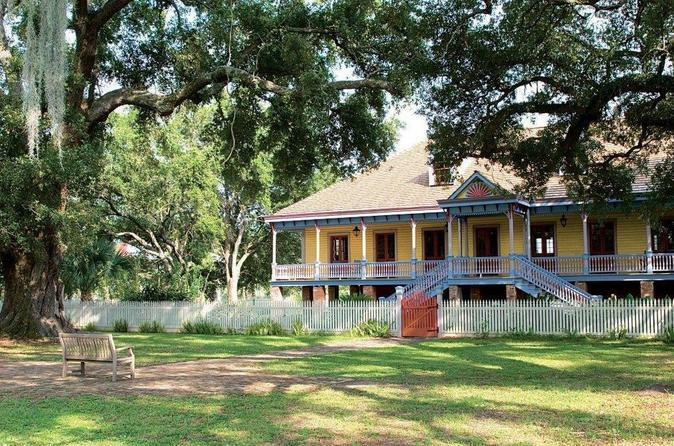 After Oak Alley you'll tour the charming Laura Plantation, where you'll enter the fascinating life of the Creoles and learn about the tragic life of the women who ran Laura Plantation for over a century. After Laura, you'll head back to New Orleans. You'll pass swamps, Lake Pontchartrain, marshes, wetlands, and the spillway. Your professional, on-board guide will inform you of other things to do in New Orleans, and recommend restaurants, shows, live music and more.